From the Ravenna Republican, July 2, 1903. We have added the pictures. Involving a Loss of Over $160,000.00 — Most Disastrous Conflagration in the History of Portage County — One Hundred Skilled Workmen out of Employment Work of Clearing Ruins begun Monday Morning and Plant to be Rebuilt in Sixty Days. The Riddle plant is in ruins, excepting the repository. Fire destroyed the great factory early Sunday morning and all that is visible of the former home of busy workmanship is a series of ragged ruins. Such is a brief statement of the most disastrous fire in the history of Ravenna. About ten o'clock Saturday night Arthur Lee, one of the employees, discovered a fire in the wood working department near a stove used for the heating of glue, and having a key to the building entered it and with the assistance of a few who responded to his outcry, put out the flames which had gained but small headway before the arrival of the department. Although everything was supposed to be safe from a further outbreak, the policemen were instructed to keep close watch of the building during the remainder of the night. There was no further evidence of fire until about midnight when the officers, who had visited the building every fifteen minutes, thought they detected smoke for the second time and promptly aroused H. W. Riddle, the president of the company, who went with them to make further investigation. They found a smoldering fire near where the first one was discovered and after extinguishing this and thoroughly wetting down the floor made a tour of all the rooms but could find no further evidence of danger. About 2:40 o'clock Officer W. J. Hotchkiss discovered a third outbreak and sent Henry Carroll to turn in another alarm while he ran to Mr. Riddle's house on the opposite side of the street from the plant to again arouse him. Almost the entire building seemed suddenly to burst into flame, which by the time the firemen were again on the scene, had taken such hold of the dry interior as to advertise the fate of the building. The big structure, with 60 feet frontage and three stories high, was almost in­stantly a holocaust of fierce fire that leaped and roared to astonishing heights above the dense sea of smoke that rolled out in stifling mass from the windows. The flames danced like a legion of demons in the super-heated air that caught up embers by the thousands and carried them in its roaring maw and scattered them for long distances about town. As the fire progressed its intensity became so great as to threaten the houses across the street one hundred feet away. As it was the paint on some of them was badly blistered and the free use of house hose was an important factor in their final salvation. 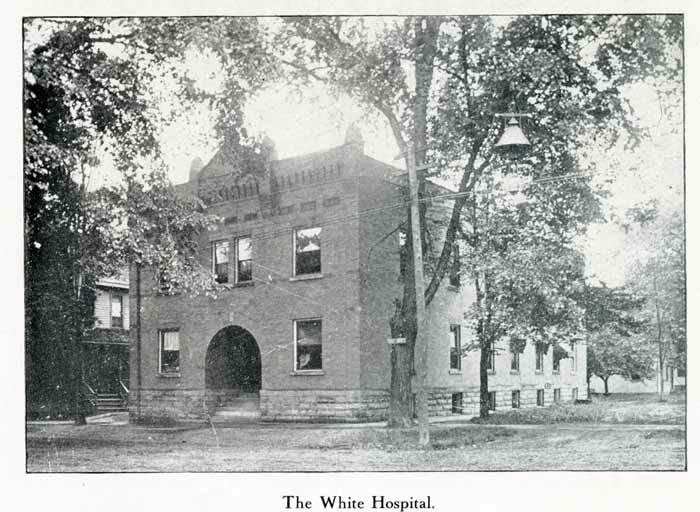 A small blaze on the roof of Severance's bakery, 500 feet to the west and across the street, for a moment threatened a terrible situation, as the White hospital, well filled with patients, is in direct connected line. The ambulance was called out, but a change in the wind to the southwest brought safety from this new danger. It was a fortunate event that during the greater portion of the progress of the fire there was comparative atmospheric quiet— a circumstance that permitted the entire interior of the main building to burn out in almost perpendicular column of flames that in a strong wind or gale would have been borne into irresistible contact with many other buildings that must certainly have resulted in a general conflagration in that part of town. Everything but the walls of the big building was burned before the latter began to fall. This fortunate event enabled the firemen to save the large repository which had been emptied of its stock of choice funeral cars and landaus, and the new block adjoining it to the north now in course of near completion. At the request of Mr. Riddle a concentrated effort was made at this latter point, but in the meantime Riddle Block No. 4. a three story business structure erected last fall, ignited from the glowing heat and although it did not yield as swiftly to the flames, was completely gutted and the west and north walls practically ruined. In this building was located on the first floor the dry goods store of John Porter and a repository for finished work from the Riddle factory and by the dry cleaning establishment of Dole & Stockwell. The upper floors were divided into living apartments occupied by the families of W. O. Cunningham, Michael O'Brien, S C. Woolf, John Litrell, A. Moore and Frank Santoro. 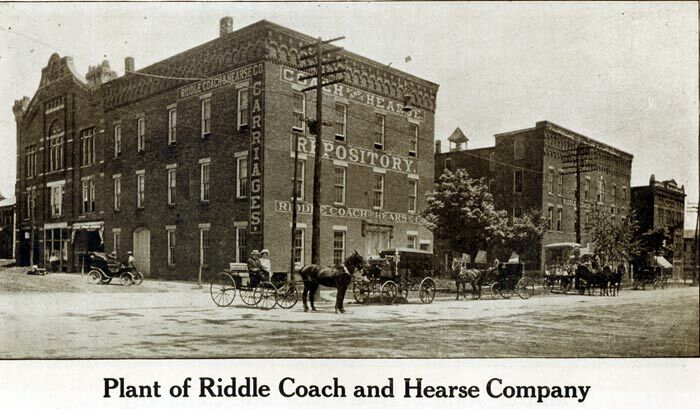 The Riddle Company lost ten completed jobs of the very best workmanship in this new building while other jobs located therein were more or less injured. Everything in the office was destroyed excepting the books in the safe. A number of commercial drafts that came in on Saturday were included in the loss. The wood workers, twenty-five in number, all lost their tools, valued at from $200 to $500 per set. It is impossible to more than roughly estimate the loss to the Riddle Company, but the figure is believed to be not far from one hundred and fifty thousand dollars. The insurance was $19,750 placed as follows: Richland Mutual, $4,000; Ohio Mutual, $1,500; Mansfleld Mutual, $1,500; Western Mutual, $1,500; Kuox Mutual, $2,000; Fireman's Association, $1,500; Concordia, $1,250; Cooper, $1,250; Central Manufacturers', $1,250; Western Underwriters', $3,000. Porter's loss from goods damaged in their removal he estimates at $2,500 and he carries $2,000 insurance. They were conveyed to the opposite side of the street and later taken to the vacant room in Empire block. There was no insurance whatever on Block No. 4. At a meeting of the Riddle company in the forenoon of the same day a request was made of Andrew Jensen that he release his contractor from work on his new business block, for which he has material already on the ground, until a later date in order that his workmen and material may be used in rebuilding the Riddle plant. This request was very promptly and very graciously complied with to the great appreciation of the company. A similar request made of Dr. W. W. White with reference to his hospital contract met the same courtesy. With splendid, promptitude and characteristic energy the company made instant decision to rebuild. It was a hot one. The firemen fought bravely. Many citizens rendered valuable aid to the firemen. The spectator who knew best just what to do was of coarse present. 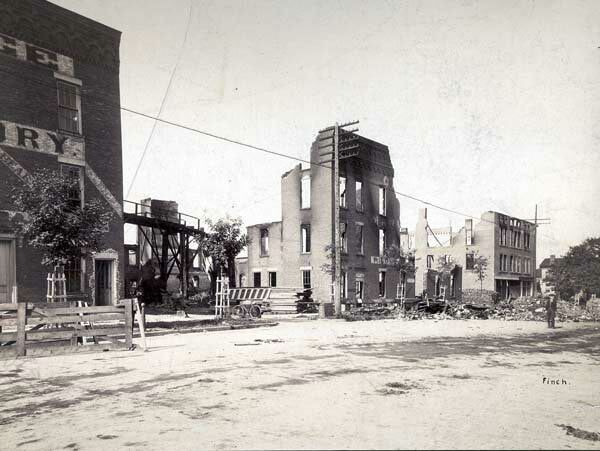 The last big fire in Ravenna was the destruction of the Grohe factory which occurred five years previous to the day, Sunday morning, June 26, 1898. Simon Frank ran a nail through one of his hands. Fred Lowrie had one of his hands quite severely cut. Orrie Dice has a badly burned hand and H. F. Smith was burned on the hands, arm and neck. John Bone, living on the Riddle property north of the repository, known as the N. D. Clark home moved his goods into the street during a threatening period of the fire and subsequently moved them back again. The tenants in Riddle Block No. 4, with a single exception, lost everything but the clothes on their backs with no insurance. It was a $3,500 Riddle company funeral car that conveyed the remains of the martyred McKinley to their final resting place in Canton and a dozen of similar pattern were in process of construction. C. P. Bradford, district foreman for the Central Union Telephone Company at Akron came over on Monday to direct the repairs on the, local line necessitated by damages from the fire. One cable was entirely burned off and two or three hundred feet rendered worthless. Their loss is estimated at $800. The Portage County Telephone Co. was more fortunate. $100 will cover their entire loss which consisted in the destruction of two instruments and the severing of nearly all of their long distance lines and about 80 home wires. Ravenna has the sympathy of Warren in the destruction of the Riddle Coach & Hearse Co.'s plant by fire Sunday morning. It is a big loss, but the town is to be congratulated that the plant is to be immediately rebuilt.— Warren Chronicle. H. P. Morgan is the oldest employee in the factory in point of years and time of service. He is 84 years of age and has held the position of trimmer for forty-two years. This makes the third factory fire he has been through, the two Riddle fires and one while in the employ of the Collins Company at Akron before coming to Ravenna. Crystal Lake was lowered one inch, representing about 200,000 gallons of water used. Coffee and sandwiches were served from the Riddle home to the firemen and assisting workers. Firemen were busy all of Sunday and Monday throwing water on the mass of burning debris which was still smoking on Tuesday morning.